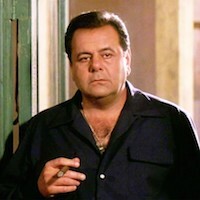 Actor Paul Sorvino has played many characters, most of whom are figures of authority, all of whom are Italian. Although you may know him for his awe-inspiring performance as Jimmy Scambino in the underrated thriller Sicilian Vampire, he’s probably most recognizable for his role as Paulie Cicero in the always awesome Goodfellas. Now he’s definitely not faking the Italian thing, the guy is so Sicilian he uses olive oil like the dad in My Big Fat Greek Wedding uses Windex. And apparently he’s not faking the mobster thing either, because he’s put a hit out on Harvey Weinstein. Apparently Weinstein blacklisted Paul’s daughter Mira after she rejected his advances, and Paul doesn’t want justice, he wants him sleeping with the fishes. Well there you have it. I love it when actors seem like they’re actually similar to the characters they play. Like how Woody Harrelson’s dad was a notorious hitman. Woody’s terrifying face totally makes sense now, right? Anyways, happy hunting, Paul. And if we find Harvey in a New Jersey marsh, I think I know who kept the cannolis.